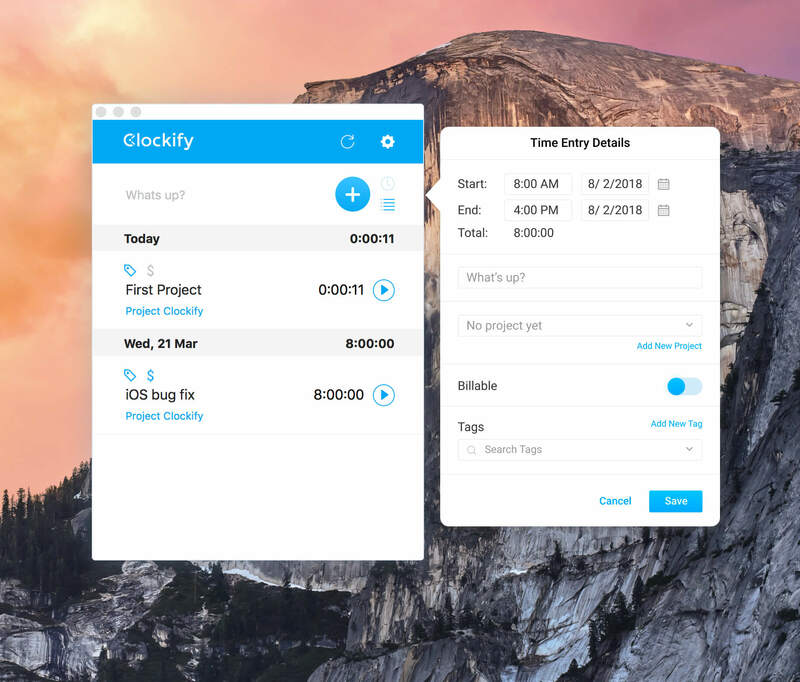 Clockify Desktop app for Mac is a native OSX application that enables faster and more convenient time tracking. 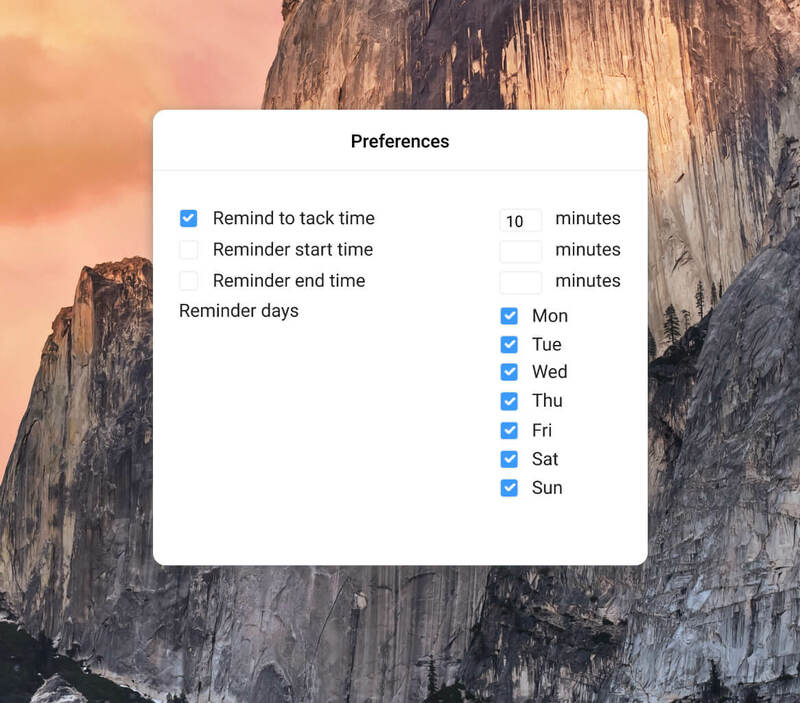 Once you install it on your Mac, you can track time right from your desktop, without having to open Clockify in a browser. Note: You can also download the Clockify for Mac on the App Store. However, due to changes in App Store’s policy, that version doesn’t have Idle Detection feature. The main purpose of the desktop app is to make time tracking faster and more convenient. You can also start the timer without the description, and then fill the details later. A popup window appears where you can enter start and end time, as well as all other details. To delete a time entry, swipe left or right to show the delete option. If you’ve already worked on some task, you can start a new timer for it with one click. Simply find the time entry you wish to continue tracking time for and click the blue play button next to it. All the data of that time entry will be duplicated, and the time will start ticking again. The time entry list shows you your most recent time entries. The list is organized by days, and each day contains the time entries you’ve made that day. Each time entry shows the project, description, duration, as well as tag and billability status. If the billability and tag icons are gray, it means the time entry is non-billable and it has no tags. You can quickly create a new project in the “Time Entry Details” popup window, by clicking “Add new project”; then you can add the project name, the name of the client, and choose the project color. After you add the project, you can then add a new task. When you click “Add New Task”, a new input field appears, where you can enter the name of the task, estimate, and choose an assignee. You can add tags in the “Time Entry Details” popup window, by clicking “Add new tag”. Don’t forget to click Save to save the added project/task/tag. Only admins can add a new project, task, and tag (preferably in the web version). You can tell Clockify to send you reminders to track time at regular time intervals. 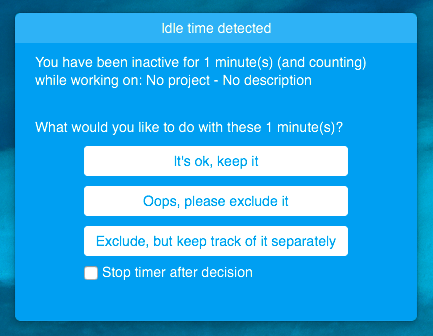 Simply check the “Remind to track time” box, specify the interval (eg. 10 minutes), and Clockify will show you a notification every 10 minutes, reminding you to use the timer. You can also set reminder start and end time, during which time the reminder will appear (e.g. from 08:00 to 16:00). Outside of those times, the reminder notifications won’t appear. You can also set days for which you want to enable/disable reminders. If you don’t want to receive reminders on Sundays for example, leave it unchecked. You can set reminders by clicking the settings icon and going to Preferences. While tracking time, Clockify Desktop app can detect when you’re away from your computer so you don’t accidentally add that time to your timesheet. The app detects when you’re inactive based on your mouse movements. If you set the detection interval to 10 minutes, after 10 minutes of no mouse activity, the app will ask you whether you want to include those previous 10 minutes (plus how long the timer was running after that) in your timesheet. Discard the inactive time from the current running timer, but create a new time entry for it. With the Pomodoro Timer, you can set up notifications that will let you know when it’s time to take a break. 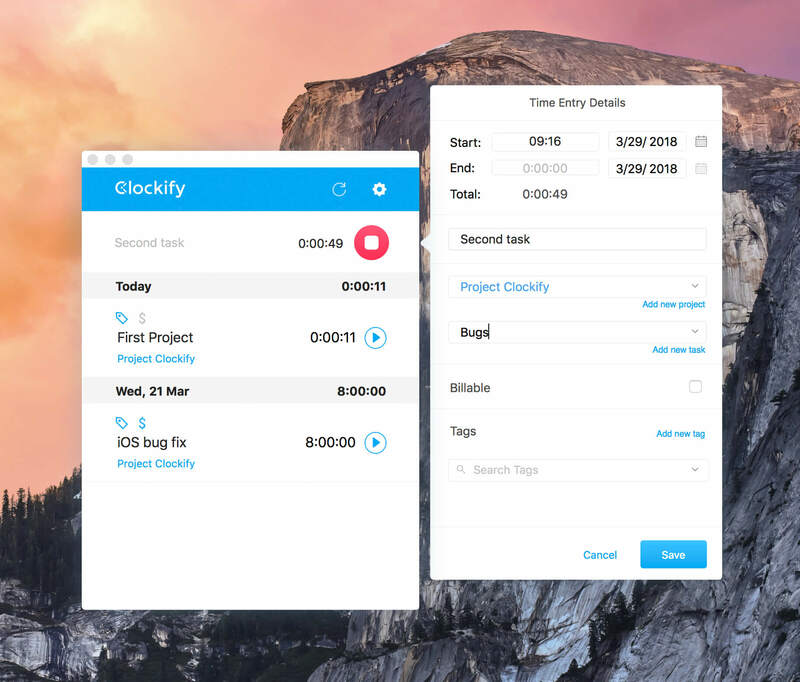 Clockify Desktop will automatically stop your time entries when they reach the end of your current Pomodoro interval, and let you know with a notification to take a break. Then, you can continue tracking time on the latest task by clicking on that entry’s play icon, or start a brand new timer. You can set just the Pomodoro Timer (when to stop the timer and give you a notification), and you can also set breaks. 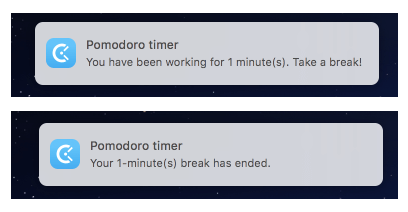 When Pomodoro break is enabled, and you reach the end of your Pomodoro time, the timer stops for the current task, and a new timer starts, with the description “Pomodoro break”. After it ends, the timer will stop, and you can start a new timer for anything you want. 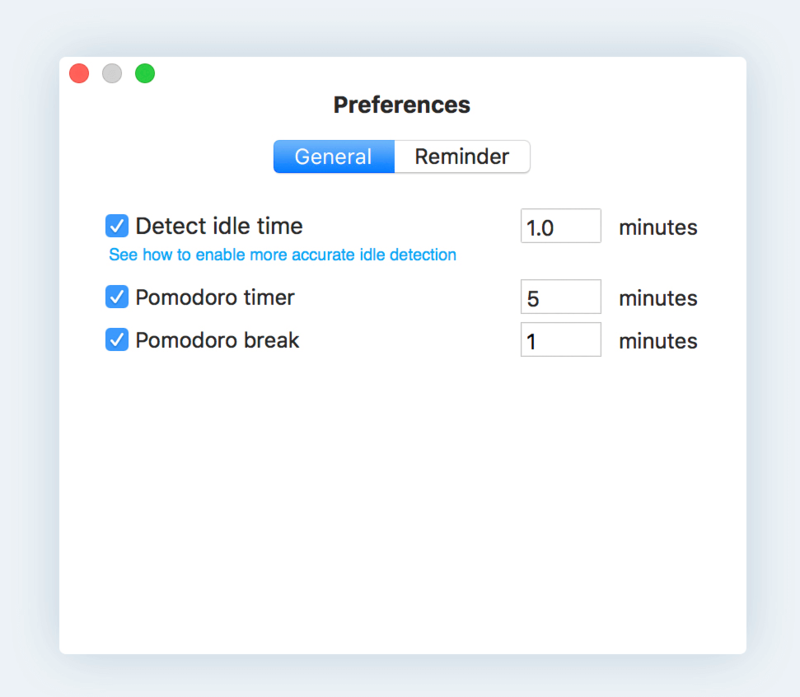 You can enable Pomodoro Timer and set your preferred Pomodoro and break intervals in Preferences. Clockify Desktop app for Mac works just like the web version, plus it also works even when you’re offline. You can regularly create time entries manually or start/stop the timer, and newly created time entries will be saved locally on your computer. Projects, tasks, and tags are also available for selection (if there are newer ones, they won’t be available before syncing). You can’t create new projects, tasks, tags, and clients while offline. The app stores data locally, and syncs with the web version once you’re online again. If you want, you can also perform a manual sync by clicking the refresh icon. If you work on the same project every day, set a default project. Then, all you have to do is type what you’re working on and start the timer, and the project will be selected automatically. 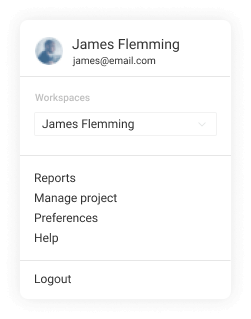 You can enable default project in the app’s Settings.